We are located on the Margaree River, one of Canada’s premiere fishing spots. Our location is perfectly located for golfers wishing to play several of the island’s best courses. 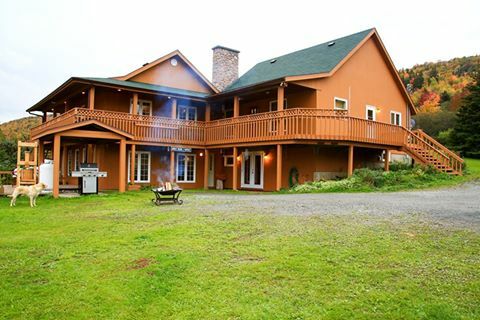 The Salmon Pool Inn Lodge is a 5 bedroom vacation home with 2500 square feet of living space that accommodates up to 10 guests. We offer a lounge area on the upper level with a fireplace and satellite television. The lower level features a second lounge in our pub. Guests enjoy the outside patios overlooking the Margaree River for dining and nature watching. Upstairs, we have 5 bedrooms with 8 beds and 4 bathrooms. When the Pub is open our guests have priority on reservations. Please visit Rates page for more details. Breakfast is available for a small charge in our pub.